While all of our almonds are produced using sustainable practices, we have some orchards that have been certified organic and certified transitional organic through CCOF. We believe in pushing the industry further and have used trial and error to develop organic farming systems that work for almonds in the Central Valley. We are dedicated to aiding in the effort to grow the organic market share. Organic to us means farming with priorities for maintaining healthy soil, biodiversity, clean water, and ensuring harmony with native ecosystems and habitats, while also using minimal resources including fuel and water and other inputs. We also believe we have a role to play in mitigating climate change. Almond orchards can sequester carbon and farming without petrochemicals can decrease emissions associated with agriculture activity. 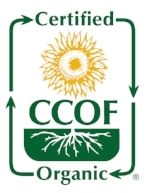 For more information on the certification and our Certified Organic product, please visit www.ccof.org. Content copyright 2016. Edelweiss Nut Company. All rights reserved.